Once an arc flash engineer or project manager has worked with SafetyPro arc flash labels, the question that is asked when any other labels are proposed for a project is "How do they compare to SafetyPro?" Compare our arc flash labels with any other supplier and you'll see the difference immediately: We use a durable vinyl label and a multi-layer process that produces the best print quality and the highest durability label in the industry. We set the gold standard in arc flash labeling quality. Our premium cast vinyl arc flash labels come with an optional red, yellow, orange, or green header; the widest selection in the industry! They are enhanced with a chemical resistant clear overcoat that optimizes print quality and label life, protecting the vinyl and the color stripe from fading, scratching and wear. 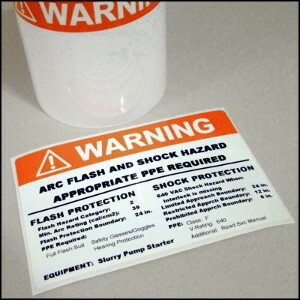 Our arc flash labels are designed to exceed the requirements of every available arc flash labeling standard, worldwide. Beyond NFPA 70E (the NEC), our materials comply with OSHA standards 29-CFR (Part 1910, sub part S) electrical standard number 1910.333; Canadian standards CSA Z462 relating to arc flash; and The Institute of Electronics and Electrical Engineers, IEEE 1584 standards relating to electrical hazards and arc flash. It is our goal to offer the best products for the best price. Our competition offers 2mil thin vinyl labels with no overcoat. The feel and appearance is paper-like. While these labels may work in the short-run, they are not designed to last in harsh conditions over time. If you're buying arc flash labels somewhere else, request a sample from Industrial Safety Solutions, then compare the labels side-by-side. Your old labels will seem as flimsy as a sheet of paper when compared to our premium industrial strength vinyl arc flash labels! Need information on the best arc flash labeling supplies for the job? 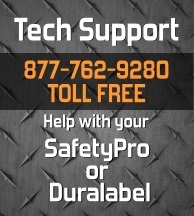 Contact us at 877-762-9280 today to find out more about how we can meet your arc flash labeling needs.